Chinese smartphone giant Huawei sub-brand Honor finally launched its Honor 8 Pro smartphone in India on Thursday. Priced at Rs 29,999, the smartphone will be exclusively available from Amazon on July 10 at 6 PM during Amazon Prime Day sale for Prime members and it will go for open sales from July 13 midnight. Some of the highlight features of the Honor 8 Pro smartphone are its dual camera setup, a massive 4000mAh battery, and an impressive 6GB of RAM. Additionally, the retail box for the Honor 8 Pro can also be turned into a Google Cardboard viewer for VR experience as well. The Honor 8 Pro Smartphone will be made available in Navy Blue and Midnight Black colour variants in India. The phone comes with a fingerprint scanner, which is located at the back and can be used to unlock the device. The Honor 8 Pro gives a stiff competition to the likes of OnePlus 5, Samsung Galaxy C9 Pro and others. 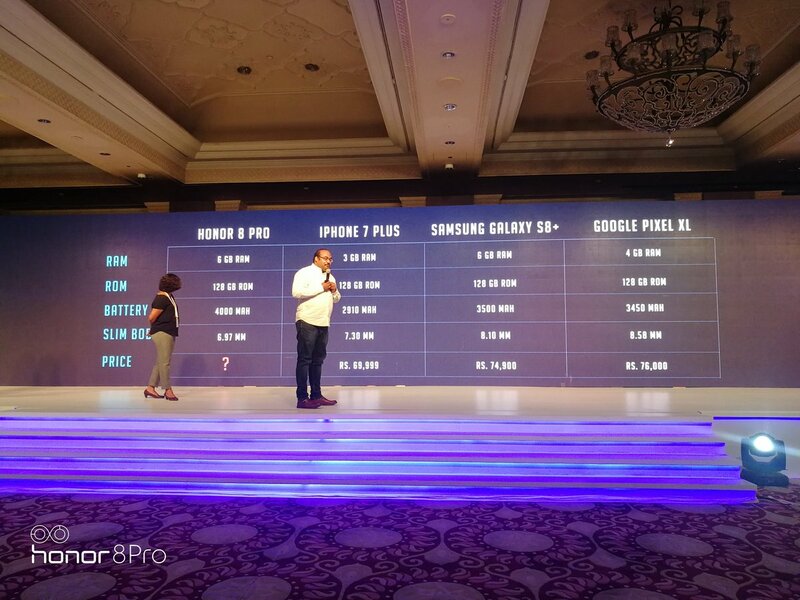 The Honor 8 Pro Smartphone priced in India is Rs. 29,999, and the company has brought only the 6GB RAM/ 128GB inbuilt storage of the smartphone to the country. At the price, the smartphone goes head-to-head with the OnePlus 5 in the Indian market – specifically, the 6GB RAM/ 64GB storage priced at Rs. 32,999 – that also sports a dual rear camera setup. 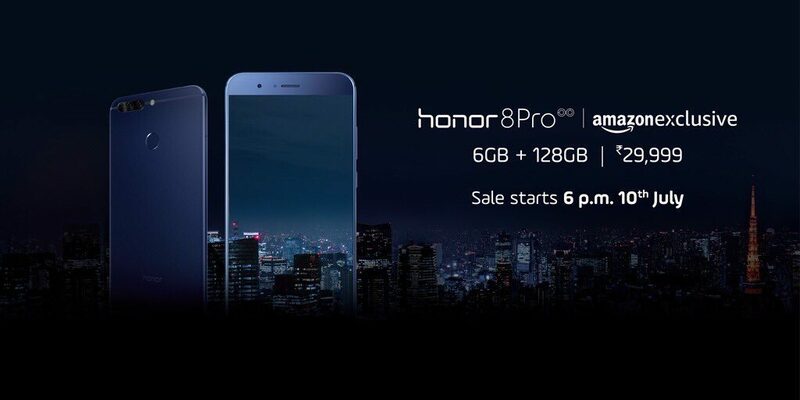 The Honor 8 Pro Smartphone will be made available exclusively via Amazon India in 2 stage sales, and its first sale exclusively for Amazon Prime members will start at 6 pm IST on Monday, July 10 – which also happens to be the start of Amazon Prime Day. Second Open sales begin from 12 am on July 13. If we talk about the Launch Offers of Honor 8 Pro, during the Prime Day sale, Prime subscribers will get 15 percent cash back if they use HDFC Bank credit and debit cards. During the open sale, Amazon is enticing users with its Vodafone 45GB over five months offer, as well as no-cost EMI options. The Honor 8 Pro comes with a premium glass and metal design that looks classy and sleek. The smartphone back is made of metal and has a matte finish while the front is a glass affair. The sides are curved and the smartphone has a screen to body ratio of 79 per cent. There is an antenna line running across the top and bottom and the phone is rather slim (less than 7mm). Despite being so slim, the smartphone still comes with a 3.5mm headphone jack and a substantial 4,000mAh battery. There are no physical buttons on the front – Huawei has opted for virtual keys for home, back and recent apps – and the fingerprint sensor is located at the back. The Honor 8 Pro comes with a pretty unique and creative feature – the box of the smartphone turns into a Google cardboard like Virtual Reality headset. There are two lenses inside the box which need to be installed after which you are good to go. There is also a VR app called Jaunt pre-installed on the phone which allows you to view a tonne of VR content. The Quad HD display ensures VR content is crisp and sharp. 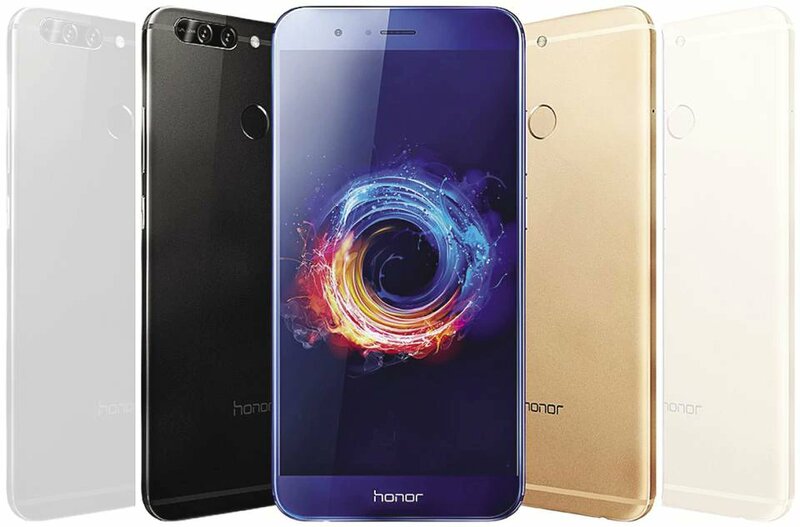 Honor 8 Pro Smartphone comes with hybrid dual-SIM runs Android 7.0 Nougat-based EMUI 5.1 out-of-the-box. 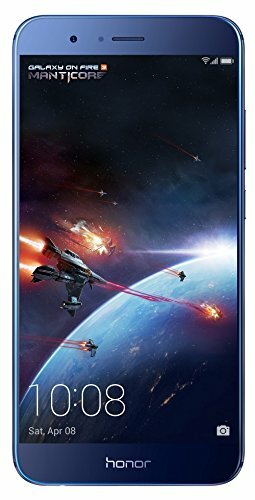 Honor 8 Pro sports a 5.7-inch QHD LTPS LCD 1440×2560 pixels display with 515ppi Pixel density with Gorilla Glass 3 protection. The smartphone is powered by company’s in-house HiSilicon Kirin 960 2.36 GHz octa-core processor (four Cortex-A53 cores clocked at 1.8GHz and four Cortex-A73 cores clocked at 2.4GHz) coupled with 6GB of LPDDR4 RAM and 128GB of internal storage, which can be further expanded up to 128GB via microSD card slot. The Kirin 960 is HiSilicon’s flagship processor and is found in Huawei’s flagship smartphones like the Huawei P10 and Mate 9. Honor 8 Pro comes with a dual rear camera setup that consists of two 12-megapixel sensors with one being used to capture RGB, while other captures details in monochrome, with f/2.2 aperture, laser autofocus, LED flash, and 4K video recording at 30 frames per second. At the front, the smartphone comes with an 8-megapixel sensor coupled with a 77-degree wide-angle lens. Huawei claims that the monochrome sensor takes in 200 percent more light and 50 percent more contrast as compared to the colour sensor. The dual camera setup also allows you to take bokeh shots – images of the depth of field effects. The rear camera setup also comes with phase detection and laser autofocus as well as a dual-LED flash. On the front, there is an 8MP shooter with an aperture of f/2.0 that can capture video at up to 1080p resolution. The connectivity options on the Honor 8 Pro smartphone include 4G VoLTE connectivity, Wi-Fi 802.11 a/b/g/n/ac, dual-SIM, an infrared sensor, USB Type-C, Bluetooth v4.2, 3.5mm headphone jack, and NFC. The Smartphone measures 157 x 77.50 x 6.97 mm and weighs 184 grammes. The handset features a 4000mAh battery that’s rated to deliver up to 1.44 days of battery life with heavy use and 2 days with regular use. Sensors on board include an accelerometer, ambient light sensor, digital compass, gyroscope, an infrared sensor, and proximity sensor. It measures 157×77.5×6.97mm and weighs 184 grammes. The Honor 8 Pro runs on Huawei’s EMUI 5.1 running atop Android 7.0 Nougat. There is a host of custom features on board and Huawei has also worked hard to streamline the software. The company claims that 90 percent of the core interactions of the device can be achieved in only three steps in EMUI 5.1. Additionally, they also promise that the Honor 8 Pro will remain lag free for 500 days. Most of the updates in EMUI5.1 are under the hood and are performance related such as improved mistouch detection, a new algorithm for recycling and freeing RAM faster called Ultra Memory, a new algorithm for faster touch response called Ultra Response which lowers touch latency and machine learning for making commonly used apps more responsive. EMUI also comes with a lot of nifty features. The fingerprint reader can be used to bring down the notification shade, you can initiate split screen multitasking and take a screenshot using your knuckles, you can flip the screen to mute a call, you can run multiple instances of a single application, you can lock certain applications and so on. honor 8 pro, honor 8 pro price, honor 8 pro youtube, honor 8 pro price in india, honor 8 pro india, honor 8 pro buy, honor 8 pro specification, honor 8 pro review. The wait ends! The much-awaited launch is here. Watch the grand Honor 8 Pro unveil LIVE right here. #Honor8Pro.